died on March 5,1883 at the age of 74. He married Mary Ann Farrell  in 1833 at Notre Dame Cathedral. Her birthdate is abt. 1817 in King's County Ireland and she died March 26, 1887. He is buried on Lot 384 C Notre Dame Cemetery, 455 Montreal Road, Ottawa, Ont. Upon his death in 1883, his son Joseph Francis inherited the plot. b. 1854, John Michael Rowan b. 1857 d 1857.
generations that I have on my computer. I have a lot of information, but I do not know how much of all this you would like. J. Rowan Hotel at 34 York St. Thanks for your e-mail. This is really interesting. My ancestors bought a farm in Osgoode Township about 1850 from Charles Rowan. History course at Carleton from John Taylor). grandaughter visited today (July 17, 2014) from Michigan, USA. material I'll post it. The Rowan's are related to many families here. Generally I just include information on people born before 1900, for privacy reasons. 1. PATRICK ROWAN was born Abt. 1790. He married CATHERINE FOYLE. She was born Abt. 1792.
born 1817 in King's County Ireland, and died March 26, 1887. 1855. His residence was 201 Clarence St.
we visited on July 17, 2014. The tombstone of William Frederick Brennan is beside the Charles Rowan gravemarker. in 1883, his son Joseph Francis Rowan inherited the plot. Charles Rowan, died March 5, 1883, 73 yrs. NAMES SHOWN IN THE CEMETERY RECORD BOOKS. i. PATRICK ROWAN, b. 1840.
ii. WILLIAM ROWAN, b. 1841.
iv. JANE ROWAN, b. July 19, 1843.
v. CHARLES ROWAN, b. 1844.
vi. MARY ANNE ROWAN, b. 1846; m. A. KIERNEY / Kearney. vii. JOSEPH FRANCIS ROWAN, b. 1849; d. January 04, 1904, At the age of 50. 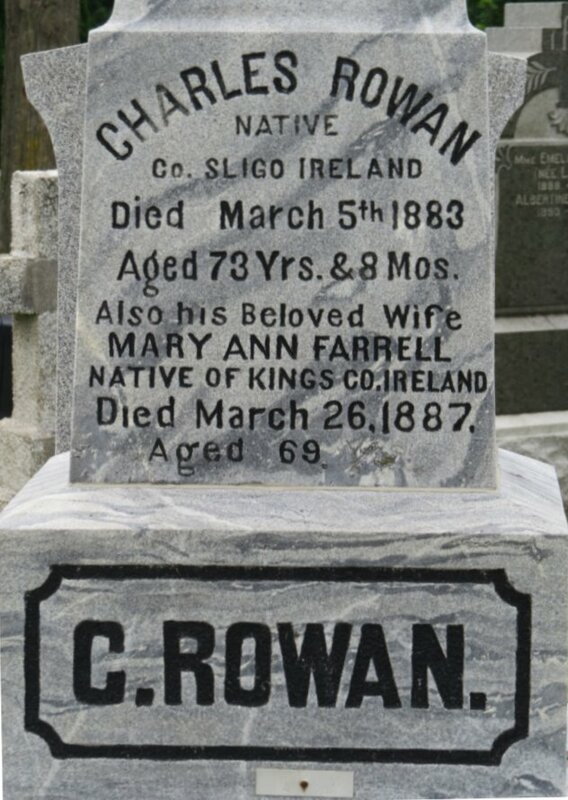 (son of Charles Rowan and Mary Ann Farrell) when he died on Jan 4, 1904. James Rowan when he made his will on Feb 8, 1899. Ontario Archives, Toronto. viii. ELIZABETH JANE ROWAN, b. 1850; d. April 28, 1886.
x. SOPHIA CECILIA ROWAN, b. 1854.
d. November 19, 1857, Ottawa, Ontario, Canada. 1848 in Notre Dame Church, Ottawa, Ont., daughter of PATRICK ROWAN and ANN PARKS. She was born Abt. 1831 in Ireland, and died November 15, 1910.
d. November 03, 1921, Ottawa, Ontario, Canada. ii. CHARLES MICHAEL ROWAN, b. 1851.
iii. MARY ANN ROWAN, b. 1851.
iv. BRIDGET ANN ROWAN, b. 1854; d. June 11, 1914, Ottawa, Ontario, Canada. v. JAMES ROWAN, b. 1857, Nepean, Ont; d. October 26, 1917, Ottawa, Ontario, Canada. Block C but the granite is red instead of grey. or third row back from the secondary road. Ownership transfered to Anna Valade Rowan, Wife of John J. Rowan May 3, 1986.
to his nephew Walter Rowan, Ontario Archives, Toronto Reference RG 22 Series 354 number 8453/1917. James originally owned and operated a hotel on York Street, near Sussex St in Ottawa. Ont. 4. vi. JOHN VINCENT ROWAN, b. March 24, 1858, Osgoode, Russell, Ont; d.
August 16, 1898, Chicago, Illinois, U S A.
vii. THOMAS ROWAN, b. 1859; d. October 17, 1886.
viii. PAUL ROWAN, b. 1862.
ix. ALBERT ROWAN, b. 1864.
x. ELIZABETH JANE ROWAN, b. 1871, Osgood, Ont; d. May 17, 1913, Ottawa, Ontario, Canada. MARGARET GREEN 1883 in Chicago, Illinois, U S A, daughter of PATRICK GREEN and CATHERINE RYAN. She was born August 16, 1855, and died December 02, 1898 in Chicago, Illinois, U S A.
death of her husband, she suffered a nervous breakdown and was hospitalized. Streets in Chicago that same night. d. November 20, 1941, Ottawa, Ontario, Canada. Coquitlam, B.C. ; m. FRED CLITHEROE; b. 1886; d. March 06, 1969, Coquitlam, British Columbia. she had her own apartment on Cooper Street in Ottawa while working for the Department of Labour. Toronto, Ontario and later in Coquitlam in British Columbia, her last residence. From notes by Maurice Rowan. v. MARGARET ROWAN, b. 1895; d. 1898. Chicago, Illinois, U S A, and died June 04, 1949 in Ottawa, Ontario, Canada. born 1890, and died December 27, 1962 in Ottawa, Ontario, Canada. From Notes taken from Maurice Rowan. i. MARY5 ROWAN, b. 1915; d. May 05, 1916. 7. ii. WALTER J ROWAN, b. April 04, 1917; d. May 18, 1989, Toronto, Ontario. 8. iii. CATHERINE ROWAN, b. October 21, 1918, Ottawa, Ontario, Canada. 9. iv. RITA ROWAN, b. July 15, 1920. 10. v. ELIZABETH ROWAN, b. November 04, 1924.
vii. BABY ROWAN, b. 1928; d. October 30, 1928.
viii. BABY B ROWAN, b. 1930; d. 1930. Ottawa, Ontario, Canada, daughter of ADELARD CARDINAL and CATHERINE GOSSELIN. 1946 in Ottawa, Ontario, Canada. at the age of 51.
foot was removed, later the lower leg below the knee and subsequently above the knee. F. Buckstein Company in Minneapolis, Minnesota. This enabled him to walk without crutches. investigated marine disasters in Canadian waters and ports from coast to coast. and Tom Rowan became the Secretary of this Federal Government Board. This is from notes of Maurice Rowan, son of James Thomas Rowan. and family resided, which was predominently francophone. of Walter and Theresa Ann Rowan in their early years. From notes of Maurice Rowan, her son. Canada; d. April 30, 1986, Cornwall, Ontario, Canda. 13. ii. MAURICE PATRICK ROWAN, b. June 11, 1914, Ottawa, Ontario, Canada. 02, 1946; d. June 29, 1984, Huntsville, Ontario, Canada. 14. iv. FRANCIS THOMAS ROWAN, b. September 25, 1921, Ottawa, Ontario, Canada. v. CECILE THERESE ROWAN, b. October 27, 1924, Ottawa, Ontario, Canada; d.
March 01, 1997, Montreal, Quebec, Canada. 15. vi. HELENE VALEDA ROWAN, b. December 15, 1928, Ottawa, Ontario, Canada. McCabe List of 1829) was related. I do know that some of the Rowans did come from County Mayo. This is a work in progress, as you well know. married Gerald Shaughnessy and I have some thread to follow there. plot with the name Paul Rowan, which I found. born 1824 in County Limerick, Ireland. and Ann Parks (so I have been told). According to the history we have, they came from Sligo County, Ireland. in Ireland. do you have this information or do you know how I can find it? never seen these pictures. It was really quite interesting. (my father's cousin) did some of the work in the preparation of it. remembers visiting was Catherine Lynch. I believe Mary married Anthony in August 1839 in Notre Dame Cathedral. is buried in Holy Martyrs of Japan Church in Bradford, Ontario. According to the 1901 census Mary immigrated from Ireland in 1839. In the meantime your site has really been an exciting find for me. Hi Al: Thanks for the quick reply. County Mayo as was Mary Rowan. was born February 14, 1813 and died May 8, 1902. great-great-grandson.) I also  have a photo of Mary Rowan O'Donnell. And yes you may add my e-mail address to your site. and photos that you would be willing to share. Today we visited Notre Dame Cemetery to find the grave marker for William Frederick Brennan who died in 1844. His grave marker is immediately east of the stone for Charles Rowan and Mary Ann Farrell. The photo of Charles Rowan's gravestone now on the Bytown or Bust website was taken the day that we were there. prior to our visit to Ireland next June, but I'm still trying. are in to members of the Brennan family? Anything you know at all would be much appreciated! !